Out here, I’m open to change. Author’s note: This essay has been on slow boil for over a year. I wrote it at a Banff Centre writing retreat in early 2017. As I worked on this strange piece, I wondered: who would ever publish such a thing? It occurred to me, a year later, that I know a guy. Special thanks to Devyani Saltzman for editing this essay in Banff. By the time the kids and I spill out the front door at 7:46 a.m., the city is shuddering to life. The last dogs of morning are getting their walks in. Ice scrapers clatter against windshields. Regardless of what chaos has just unfolded inside our house — tantrums and lost tempers — we are now in motion, saved by the sidewalk. Our little pilgrimage has begun. In the chill of morning, we can all breathe a little more deeply. My shoulders, tight with tension in the house, begin to relax. We become quiet. With senses sharpened, I become aware of my body, of sound. Our footfalls create three rhythms, forming a percussive chorus of crunching snow. To the east, behind our townhouse, we see a mustering of orange and pink light. In 2014, I left a full-time communications job at a local charity to be home with the kids. With Laila, our oldest, about to start Kindergarten at the time, we had to decide where she’d go. We chose what was closest: a century-old public school a few blocks from home, easily walkable. As a journalist comfortable with freelancing, it made more sense for me to be the at-home parent carting kids to and fro than my wife, a teacher. So I stayed home and I walked. Accompanying two small children across a tiny scratch of Earth became my life’s primary work. I knew nothing of how this walk would become my lifeline, a path where I’d learn to pray. At first, I didn’t perceive the walk’s hidden value. Often I had the feeling of life passing me by. Peers got promotions and new jobs, and here I was out walking again, an at-home parent without anything much on the go. What I had was this walk. “Are we on time?” asks Laila, who is prone to worry. At the four-way stop, we step into the street. “We’re good.” The crosswalk, invisible under snow, is dappled with little humps of ice, polished into being by countless spinning car tires. We step carefully as drivers wait for our procession, with Sam always a few steps in front or behind, his hood cinched tightly around his face. We live not far from the confluence of two prairie rivers, settlers on the land of the Blackfoot, Tsuut’ina and Stoney Nakoda people. Our route runs along a wide street painted with bike lanes. On the opposite side, a dad I know from the local tiny tots playgroup bikes eastward on his way to work. Both of us wave in silent greeting. As we walk, we can see the tops of downtown’s glassy towers. Lazy plumes of steam drift up from the skyscrapers. Sam intentionally runs into a utility pole and pretends to be hurt. “Owie!” He gets up and laughs, then does it again at the next pole. 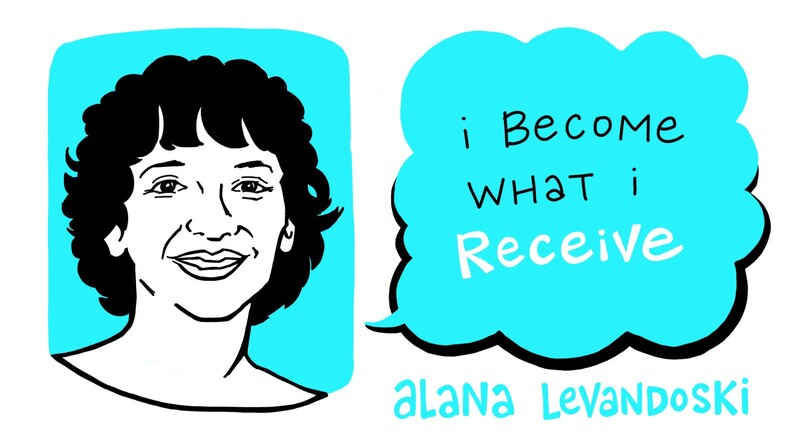 This short but ever deepening chant, by singer-songwriter and Christian contemplative Alana Levandoski, is written in the style of Taizé, an ecumenical monastic community in France where thousands of young people go on pilgrimages to pray. Pope John XXIII famously described Taizé as “that little springtime.” Taizé songs are short and meditative, just a few words sung in gentle repetition. How can anyone pray without knowing it, controlling it? This wasn’t my childhood experience of prayer — at all. As I learned it, prayer was fearful and defensive. Prayer was a minefield. My family’s church roots are in the Wisconsin Evangelical Lutheran Synod (WELS), a small ultraconservative denomination my parents grew up in. The church saw itself as threatened not just by secularism, but also by other Christian denominations that had liberalized even slightly. To pass undefiled through the world’s perilous terrain, the synod developed strict rules on prayer: you could only pray with other WELS members. No Catholics, no Anglicans — not even non-WELS Lutherans. You had to uphold absolute purity of fellowship and doctrine. You had to remain set apart. God expected it. My grandfather, born in Germany and ordained in the Wisconsin Synod, served as a WELS pastor for two decades, eventually leaving the ministry in disillusionment. Late in life, he told me about pastoring in small-town North Dakota and being visited by a distraught parishioner whose friend had died. The man wanted to know if he was permitted to attend the funeral, as it would involve praying with the wrong people. You should absolutely go, my Opapa replied. The question disturbed him. Many decades later, Opapa wept as he shared the story with me, the wound still tender. In the 1960s, WELS sent Opapa from the Dakotas to St. Albert, just north of Edmonton, to establish a Canadian outpost. That’s where we went, every Sunday, for worship. We sang hymns and recited prayers from the liturgy. I mostly remember the strange building designed by Edmonton architect Peter Hemingway. It was largely underground and topped with a pyramid-shaped roof. Hemingway is best known for the sunlit glass pyramids of Edmonton’s Muttart Conservatory, but St. Peter Evangelical Lutheran Church, with its grey concrete walls, had the feeling of a bomb shelter inside. Embedded in my childhood experience was a deeper prayer beyond rules and religiosity — even beyond words. It took years to peel away the layers, and what I discovered was joyous relief: prayer is pure gift, a gentle awakening. It’s more of a stream I step into than anything I conjure up. And its transformative power isn’t in separation at all, but connection. The renowned Catholic priest and writer Henri Nouwen said the first step in prayer is opening our clenched fists in a gesture of receiving. Sounds easy, but it’s not. By default, I want to cling and control. 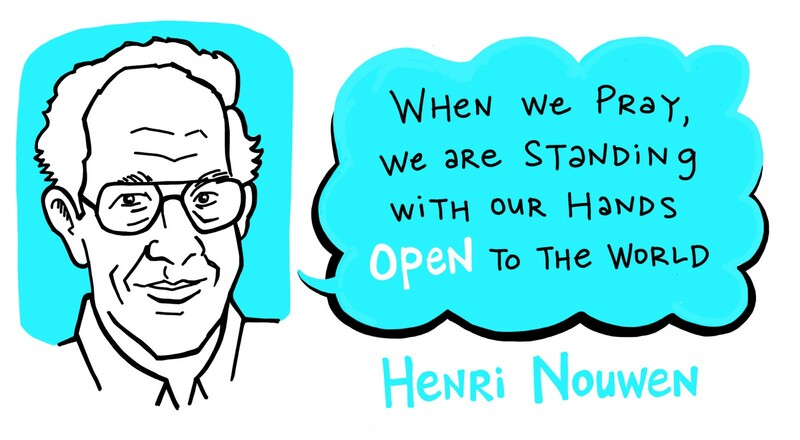 “Behind each fist another one is hiding,” Nouwen writes. By walking to school, I learn to open my hands, if only a little. Our feet scrape bits of gravel with each step. The street pulsates with a sonic richness that can be easy to miss. Cars whoosh by. A truck backs up and beeps somewhere in the distance. Airplanes emit a low hum as they prepare to land. Cheerful birdsong erupts from a backyard we can’t see. If there’s a gap in traffic, you can hear the whispering flutter of birds’ wings, the soft push of foot on twig. Previously, I aspired to greater pilgrimages than this. Not long after my wife and I got married, we planned to walk the Camino de Santiago in France and Spain, a popular pilgrimage route to the burial place of St. James the Apostle. Friends would return from the Camino with tales of outward exhaustion and inner transformation. 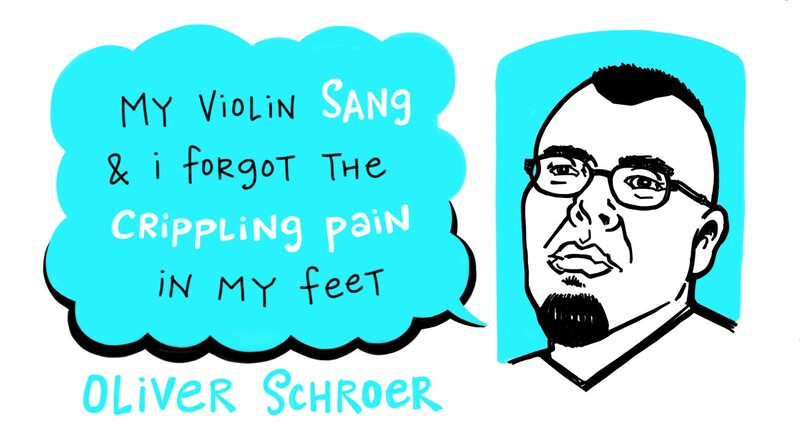 We listened repeatedly to Camino, the masterwork of the late Canadian violinist Oliver Schroer, who walked the pilgrim trail in 2004 and recorded in churches along the way. I wanted to go find my Camino. But then, a surprise: we were going to be parents. The great pilgrimage would have to wait. As a father, I was embarking on a new journey — and like traveling on the Camino, it involved walking in a new way. Instead of learning endurance and care of sore feet, I had to learn how to slow down, how to be present. Walking with young children is a little like walking a labyrinth: you can’t go fast. It just doesn’t work. In a labyrinth, you slowly walk in a circuitous pattern toward an inward point, then back out again. You move mindfully, slowly, without judgment. I began to imagine my walks with the kids as taking place in a labyrinth that had been picked up, shaken and laid flat like a rope, with the odd twist and bend. In this way, walking with the kids became an opportunity for meditative prayer. After crossing at the four-way stop, we pass a transit stop with a newspaper box and a bench. Usually two or three people are waiting for the bus, tapping away at their phones. Sometimes I get a reply, sometimes not. This routine troubles Laila, who confides on our walk one day that she feels sorry for me when I say hello and someone doesn’t reply. It’s hard to watch, she says. She wishes I would stop greeting strangers aloud. But on a mostly-empty sidewalk like ours, it feels wrong to pass by and say nothing. 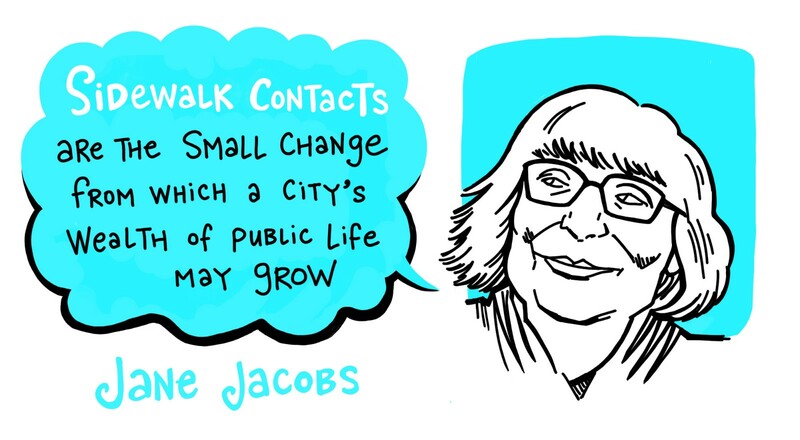 In The Death and Life of Great American Cities, Jane Jacobs emphasized the value of “sidewalk contacts”: if we restrict interesting encounters to our private circles alone, cities become stultified. “Lowly, unpurposeful and random as they may appear, sidewalk contacts are the small change from which a city’s wealth of public life may grow,” writes Jacobs. In other words, it pays to be out there and look someone in the eye. Unfortunately, the walk to school is on the wane, thanks in part to car-centric city design. Only one in four Canadian kids use active transportation to get to school, according to ParticipACTION. Laments tend to focus on the physical toll, such as rising obesity levels. But that’s not all that’s lost when we stop walking. We also miss out on rich psychological and spiritual benefits. In an age of endless hurry and noise, strolling along at five kilometres per hour is powerfully orienting. The walk contains glimpses of transcendence, but they are just that: occasional flashes. My walks are rarely, if ever, euphoric. Sometimes I’ll be stirred by a cloudless sky, or the way long morning shadows fall on a fence. Other days, I’m entirely focused on getting the kids to school on time, seeing very little along the way. My gratitude for this tiny journey is strongest on the days I don’t do it. Without the morning walk, I feel adrift. Left to my own devices — my computer and phone in particular — I’ll never go out unless I have to. With my wife at work and the kids at school, I’ll constantly check social media. Hungry for human connection, I over-consume its illusion. With each compulsive flick of the feed, an emptiness gnaws within. When I’m writing and get stuck, my tendency is to clench up and try harder, locked to the screen at all costs, even as I spiral downward, accomplishing nothing. Because I have to do the walk — getting the kids to and from school is not optional — it saves me from my shame spiral, forcing me out into the world. After greeting the bus people, we encounter the mystery dog. We’ve only ever seen peeks of it. The dog lives on the other side of a high wooden fence that has the narrowest of cracks. The property is a backyard fortress, obscuring any line of sight between the sidewalk and the alley, where cars sometimes zip across the sidewalk without warning. The dog barks maniacally when we pass. The boards bend out a little as the dog presses against the fence, claws clicking madly on wood. “Dumb dog,” I say. Sam repeats it: “Dumb dog.” We continue this call-and-response, as we always do, until we hit the next crosswalk: dumbdog dumbdog dumbdog. When we reach the little Russian Orthodox Church, with its shiny onion dome, we know we’re more than halfway. Tucked onto a side street, the church is the architectural highlight of our pilgrimage. The dome is surrounded by four smaller ones, all topped with crosses. The scene is beautiful, but for us it is also a warning: we are coming to the end of the houses and must brace ourselves for the biting north wind. When I was maybe four or five, my family left the WELS church amid a bitter dispute. The sticking point was prayer. My aunt had sent her son to a Pentecostal school, which meant he’d be praying with the wrong people. In response, the WELS pastor, fresh from seminary and full of certitude, froze my aunt out, refusing to serve her communion. My grandparents took a stand with their daughter, resulting in their excommunication from the very church they’d built. We — along with all of my father’s family — moved to a more mainstream Lutheran denomination. This created a painful rift, as my mother’s family remained WELS. Both sides of the family were cordial enough, but even as a child, I picked up on the tension. Meanwhile, in the small town by Edmonton where we lived, my siblings and I attended a private Christian school affiliated with a charismatic Pentecostal church. Occasionally we’d go to one of their services, held in a local community centre where wooden chairs were set out in rows. There was a lot of strange commotion, very different from the liturgy we were used to. Worship there was free-flow and spontaneous. Unpredictable. People sang with hands raised and spoke loudly in tongues. I sweated profusely, didn’t know where to look. The school itself was at the end of a strip mall. Its fundamentalist curriculum, called Accelerated Christian Education (A.C.E. ), came from Texas and was virulently homophobic, sexist and unscientific. Dr. Donald Howard, A.C.E.’s founder, found fertile ground for his extreme views in rural Alberta, where multiple A.C.E. schools sprang up and still persist with partial public funding. (Notably, former Conservative cabinet minister Stockwell Day helped run an A.C.E. school in the 1980s.) The Alberta government audited A.C.E. curriculum in 1984 and found “unacceptable” science material and “insensitivity” toward people of colour, but A.C.E. somehow stuck around. I learned to regard outsiders — the “lost” — with suspicion and pity. I loved when missionaries came to our Wednesday chapels with their slide shows and tales of international daring. I aspired to their greatness. In class, we read of American missionaries such as Jim Elliot, who traveled into the remote Ecuador jungle only to be slain. Steeled by prayer, they became martyrs. Heroes. Reading of the exploits of Brother Andrew, who snuck Bibles into the Soviet Bloc and was known as “God’s Smuggler,” I dreamt of becoming a missionary to the U.S.S.R. When the Berlin Wall fell and our teachers gleefully brought chunks of it to school to show us, I was a little disappointed: no more Iron Curtain to cross. Nothing seemed out of place to me at the time. I knew we were under threat from the world outside, which was set against God. A spiritual war raged. Satan lurked like a lion, and to avoid his clutches, we had to pray. Prayer girded our certainty, kept us strong. I learned to regard outsiders — the “lost” — with suspicion and pity. Prayer kept us — the “saved” — closed off from a dangerous world. Over time, my family went through a series of openings. We switched to a Baptist church when I was 12. With its modern music and improvised prayers, it felt fresher than the Lutherans’ wooden liturgy. For high school, I left home and lived at Prairie Bible Institute in Three Hills, Alberta — another institution influenced by American Christian fundamentalism, but refreshingly non-denominational in its approach. By now, however, my image of a disapproving God had been set. After high school, I joined an evangelical organization that sent young adults on short missionary trips. I was no good at making converts — I converted no one, and spent our “mission” to the 2002 Salt Lake City Olympics buying and reselling Roots-brand berets, on the sly, for profit — but here I got introduced to a new way of prayer. We’d sit in a circle and be quiet for awhile. Ten minutes. Fifteen minutes. Then we’d go around the circle and everyone would say what they “got” from God in the silence. An image maybe, or an idea. I was drawn to the practice of stilling the mind and being present in silence, listening for God, but often I had nothing to share with the group afterward, and felt embarrassed to come up empty. I dreaded praying aloud. What to say? Every day, thousands of little pilgrimages are underway in our city, and many more worldwide. Ours is this walk. For another, it’s a bike ride by the river, or a night drive. For my wife, it’s walking down the hill to work, a calm space between the busyness of parenting and the clamour of the school where she teaches. We all use different language to describe these daily journeys, but with a little attention, these liminal spaces can centre us, reorient us and reconnect us. I learned to see my commute this way thanks to women who practice the spirituality of St. Ignatius of Loyola, the 16th-century Spanish priest and mystic who founded the Jesuit order. In Calgary, as a journalism student, I discovered Ignatius by the Elbow River in a contemplative centre run by the Faithful Companions of Jesus (FCJs). The FCJ sisters spoke, with no hint of fear, about how “God is in all things” — Ignatius’s spirituality in a nutshell. This view was a radical departure from what I’d grown up with. These women didn’t see the outside world as an evil force to be kept at bay. They viewed the world as a revelation, the very place God was present. You just had to look. Their interest also went beyond the individual. In the religion of my youth, personal salvation was paramount. You “got saved,” then tried to save others. The FCJs, by contrast, had a more humanist vision. They recognized the divine in those outside their group, and spoke of how people are more interconnected than we realize. I felt I’d found a secret room in the house of faith that nobody had told me about. I could breathe better in here. I started meeting with a spiritual director, an FCJ sister, once a month. 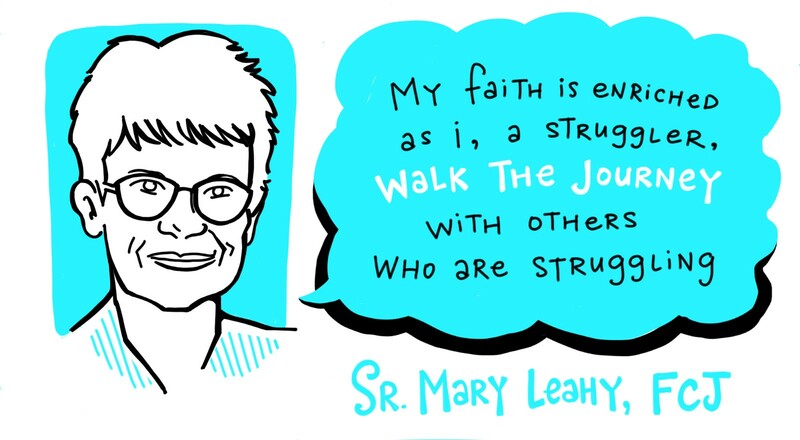 The Lutheran in me felt a little deviant, meeting with a Catholic for guidance, but Sister Leahy opened my eyes to the sacred in the everyday. In our meetings, she’d ask: where have you seen God in your life? The rote answers and certitude of my youth were of little use here. After passing the Russian church, we step into the blasting wind. To our north, there are no more houses, just an open park with a fresh bed of undulating snow. All pilgrims, whether on the Camino or elsewhere, need gear. The kids’ backpacks are laden with apple slices and ham sandwiches. My backpack contains an assortment of parenting items, including Band-Aids, tissues and a pink rubber ball. The ball might seem frivolous to the journey, but it’s not. There’s a skating rink in the park in winter, but in summer, it’s where Sam and I play baseball, sometimes for hours. Just as city streets become labyrinths, Sam and I turn grassy spaces like this into big-league ballparks. All we need is a stick of some sort for a bat. After finding a branch, Sam glowers menacingly over a squashed Coke cup, our makeshift home plate. I toss the ball gently, watch him belt home runs to right field. I carry that ball even in winter, in hopes of spring. 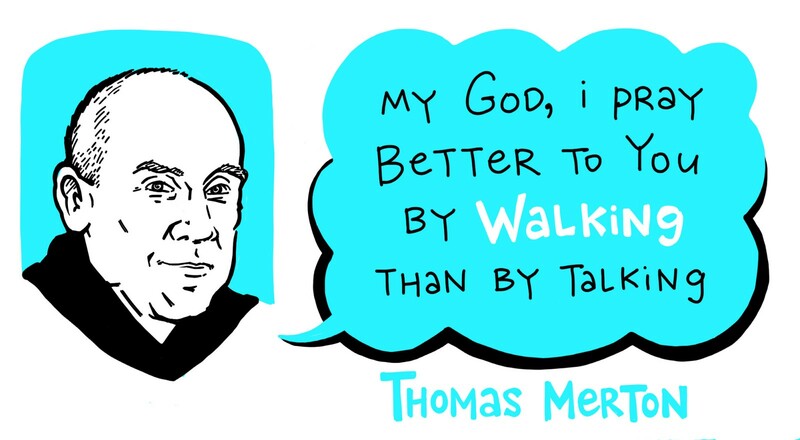 In college, owning no car and traversing Calgary by bus for school, I spent a lot of time reading Thomas Merton, the prolific Catholic monk, peace activist and writer. In this I was following a well-trodden path: Merton’s autobiography about his journey to the monastery, Seven Storey Mountain, has formed a gateway to contemplative spirituality for countless others. His writing on faith and politics opened new dimensions for me. Here was someone who could see. He was extraordinarily alert to the political perils of his time — the Cold War and the threat of nuclear annihilation — without becoming frantic. Cloistered away in the monastery, he was more connected than most. He suddenly saw his life in the monastery with fresh clarity: all the “supposed holiness” and self-renunciation suddenly appeared to him as almost comical. Merton’s epiphany occurred not at the monastery where he spent all his time, but further afield, on a city street. He stood on the corner awash in joy. On our walk, I’m often surprised by how quickly our home dramas get put into calm perspective. The liminal space between home and school, the rhythm of walking — these combine to bestow a certain grace, a gentleness with ourselves and each other. My inner critic gets overwhelmed out here and gives up, quiet. Meanwhile, I’m able to identify with more clarity my fears and attachments to control. I think back to a half hour prior, when I shouted at Laila over breakfast for spilling milk out of her cereal bowl, making a mess. Why did I lash out angrily over something so inconsequential? What am I afraid of? Here on the sidewalk, I’m open to change. Out here, rather than trying to make converts, I see my own need to be converted, again and again. It’s 7:58 a.m. We’ve been walking for twelve minutes. As we pass the Hug & Go parking zone by the school, kids leap from SUVs to the sidewalk, chased by goodbyes. The sandstone school is resplendent in blazing gold, lit by sunrise. A magpie warbles in a tree. Laila reaches for my hand. Jeremy Klaszus is editor of the Sprawl, which imperceptibly took shape as he walked. Sam Hester is a Calgary-based comics creator. The Sprawl is 100% crowdfunded and ad-free. If you value our Calgary-focused journalism, please sign up as a monthly patron! With your support we can continue to do high-quality, in-depth local storytelling.